(Nanowerk News) In the natural world, proteins use the process of biomineralization to incorporate metallic elements into tissues, using it to create diverse materials such as seashells, teeth, and bones. However, the way proteins actually do this is not well understood. Now, in research published in Angewandte Chemie International Edition ("Biomineralization of a cadmium chloride nano-crystal by a designed symmetrical protein"), scientists from the group of Kam Zhang at the RIKEN Center for Life Science Technologies (CLST) and the group of Jeremy Tame at Yokohama City University in Japan have used an artificially designed protein to create a cadmium chloride nanocrystal—the smallest crystal reported so far, made up of just 19 atoms—sandwiched between two copies of the protein. Structure of the cadmium chloride nanocrystal. In 2014, the groups announced the development of an artificial protein, called Pizza6, which looks a lot like a pizza cut into six identical slices. The groups' goal was to design novel proteins—which do not exist in nature—which could be put to a variety of uses. Proteins like Pizza, with its high degree of symmetry, do not exist naturally, but because they can be artificially created, are attractive scaffolds for the creation of new hybrid biomaterials suited to a variety of purposes such as drug packaging and delivery to cells, or even bioremediation of hazardous metals in the environment. In the current research, the Pizza protein was modified by introducing a metal-binding site. According to first author Arnout Voet, who performed the work of designing and building the proteins, "Our initial impetus was to design metal-binding sites to control the self-assembly?of our designed symmetrical proteins. We used computational methods to find a rational way to incorporate a metal-binding site into the Pizza protein we had previously designed, based on the idea that this could allow us to control protein assembly easily. We believe that this would give us a new tool for building novel proteins from the ground up by using very cheap metal reagents." 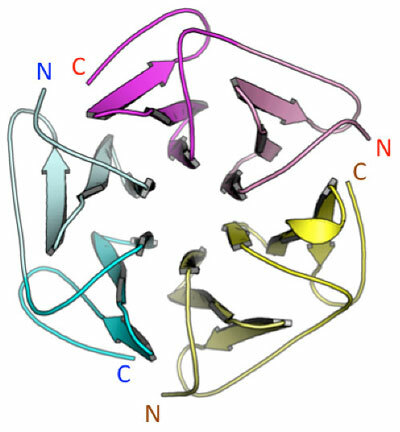 Indeed, when the proteins were modified to have a metal-binding site and then placed in a solution of cadmium chloride, the researchers found that trimers of the protein would spontaneously bind together. Using RIKEN's SPring-8 synchrotron facility in Harima and other facilities, they analyzed the structure at the atomic level and discovered, interestingly, that the atoms of cadmium and chloride had formed a tiny lattice—a crystal structure—sandwiched between two "pizzas." Structure of a Pizza protein. 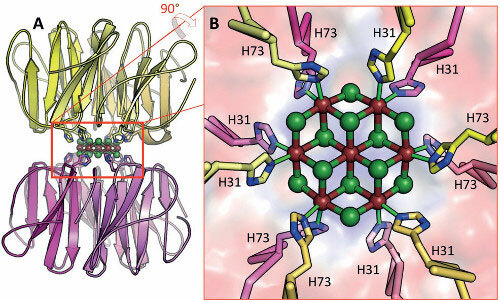 According to corresponding author Kam Zhang, who led the RIKEN team, "We were very excited to see the formation of the crystal, as it provides insights into the process of biomineralization—the process through which nature incorporates metallic elements into tissues to form structures such as seashells, teeth, and bones. Our results indicate the feasibility of using rationally-designed symmetrical proteins to biomineralize nanocrystals. Achieving this could allow us to make a wide range of nano-devices such as biopharmaceuticals, biosensors, light-driven switches, and synthetic enzymes from the bottom up." "We have many ideas about how this might be put to further use," he continues, "and will continue to experiment to find novel properties in these artificially designed proteins."